Wand has a built-in gravity switch which only allows the wand to operate in the correct horizontal position, so besides being effective and easy to use, it's also very safe! 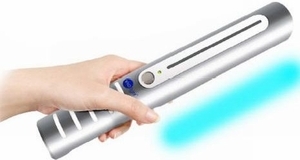 Unlike other hand-held UV devices, our Violight UV Wand will shut off automatically if accidentally pointed up at the eyes. Proven germicidal ultraviolet technology - same technology used in hospitals. Destroys 99.9% of germs it comes into contact with. Safety Switch shuts off it held upright or face-up.